Thanks for your interest in Pigskin Pick'em. This year's game has ended. The NFL is back! You're ready to dive into another season of ESPN Fantasy Football, cheat sheets out and sure to prove your drafting skills are on point - but what about your TEAM-BASED knowledge? This is the place to prove you can pick winners. The objective of this game is simple: select the winner of each NFL game throughout the 17-week season by picking either straight-up, against the point spread, or by confidence ranking your straight-up picks. The most correct picks over the course of the season in EACH format (spread, straight-up and confidence) wins a $2000 Amazon Gift Card! We're offering a $100 weekly prize in every format throughout the season, and since you're eligible to play in all three you're never out of the running for a great cash prize. Straight-Up: This is the simplest format: pick a team to win, whoever you think is more likely to come out on top. Perhaps this format is a bit easier than the other two but it's a classic nonetheless. Spread: Before each NFL game begins we will assign it a point spread which helps to even the playing field and make the matchups more competitive. For instance, if the Packers are a 10.5 point favorite and they are winning by 10 in the 4th quarter the game might be over but the SPREAD still hangs in the balance - and so does your pick. The question is, can you beat the Vegas handicappers? Confidence: In this format your picks are RANKED based on how confident you are that each of your selections will win. The higher your confidence is on a pick the more points you'll receive if that team prevails. This means that a good week is no longer dictated strictly by the number of correct picks you make, for if your two most confident selections end up losing then a lot of points will be left on the table. At the same time, a successful week here may offer the biggest reward in validating your skill, savvy and overall football knowledge. Tell your friends and start a group today (or if you're me, message them and feign an exorbitant amount of confidence without any grounding in reality that the league trophy will be returning to my mantle in '17). Good luck and have fun! 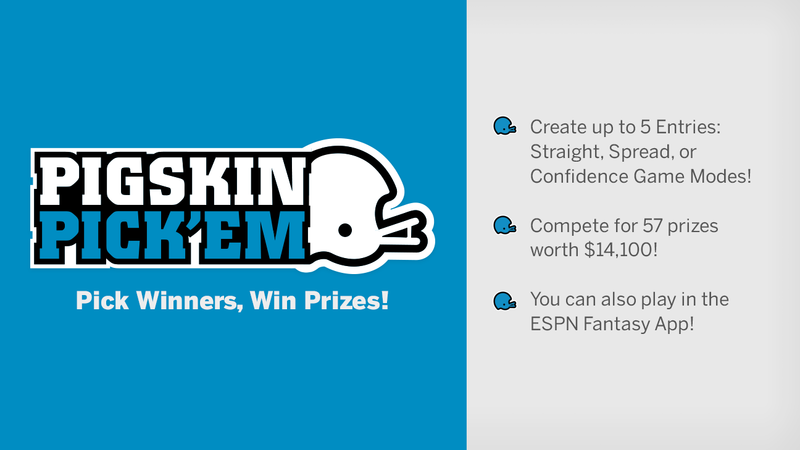 Play Pigskin Pick'em for your chance to win a $2,000 Amazon Gift Card. There are 57 prizes (weekly & season-long) worth $14,100 in 2018!